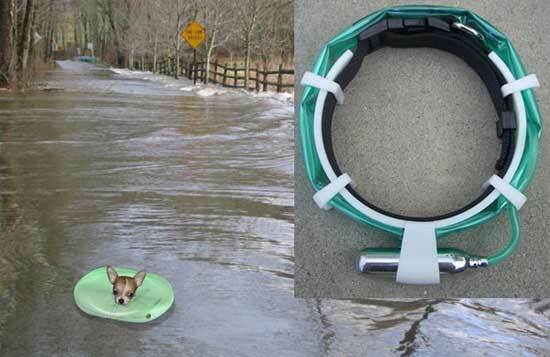 Keep Your Pooch Afloat In An Emergency | OhGizmo! I’ve never had a dog that couldn’t swim. In fact, all of the ones I did own loved to go swimming. I guess I always figured that swimming was just one of those normal things that every pooch can do. Apparently there’s enough of a demand for canine water safety equipment that someone developed this floating collar. This strange contraption is worn just like any other collar, but has a few tricks up its sleeve. There is an on-board humidity sensor that can detect when it has been submerged in water. The collar then inflates to keep man’s best friend from sinking. The collar seems pretty obtrusive to be worn all the time, so I guess you would just put it on when it starts to flood, or you decided to take your pup out on the lake. It’s currently only a concept design, so you’ll just have to teach your pet how to doggy paddle for now. Thats a nifty idea. I think its more practical than just flood use. Supposedly, a lot of house pets drown in pools in the summer, not because they can't swim, but because they can't get out of the pool, and get tired. what a neat device, not sure the dig would be very happy, looks uncomfortable, bizarre photoshopped pic!